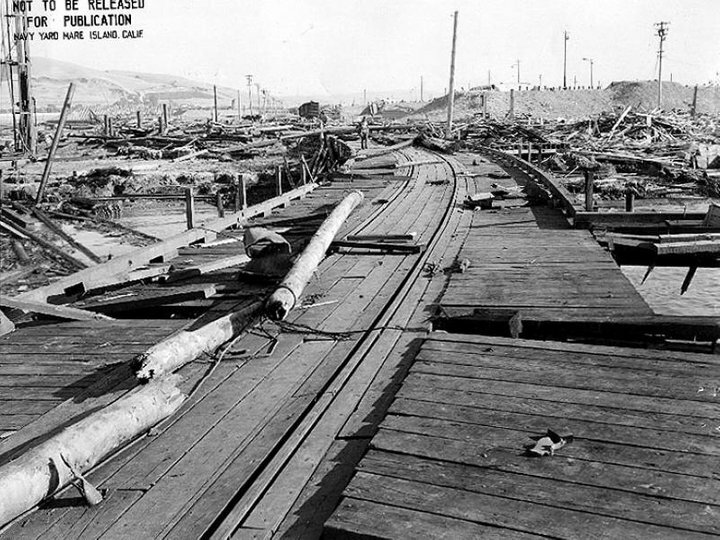 Photo of the aftermath of the Port Chicago disaster. Washington, D.C. – Today, in honor of Black History Month, Representatives Mark DeSaulnier (CA-11) and Barbara Lee (CA-13) reintroduced a House Resolution calling for the public exoneration of the Port Chicago 50. The resolution is part of their ongoing effort, first started by former Congressman George Miller III, to bring attention and solutions to the injustice suffered by the Port Chicago 50, a group of African American sailors who were wrongly convicted of mutiny following the deadliest home front disaster of World War II at the Port Chicago Naval Magazine in California. After experiencing segregation in the Navy, 435 African American munitions sailors, who were not properly trained or supported, were killed or injured when a cargo vessel exploded. This incident accounted for more than 15 percent of all African American Naval casualties during WWII. When 50 of these men understandably refused to return to the unsafe working conditions that killed their fellow sailors, they were discriminately charged and convicted of mutiny. Representatives DeSaulnier and Lee have introduced this resolution in both the 114th and 115th Congress, and together they sent a letter to former President Obama requesting he acknowledge the injustice suffered by these sailors and remove these racially biased convictions from their records. Additionally, Congressman DeSaulnier successfully included a provision to the National Defense Authorization Act (NDAA) requiring the Navy to investigate the circumstances surrounding the treatment of sailors at Port Chicago. This led to the Navy acknowledging the injustice that was served to the Port Chicago 50. DeSaulnier has also called upon the Smithsonian Institution to include information about the Port Chicago 50 in the new National Museum of African American History and Culture. To learn more about the Port Chicago disaster and memorial visit https://portchicagomemorial.org/.